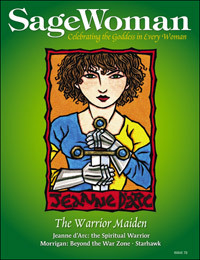 SageWoman #72 The Warrior Maiden (download) [sw072e] - $6.95 : BBI Media - Magazines that feed your soul. Wrestling with the varied (and sometimes controversial) aspects of "women as warriors", this issue begins with Patricia Snodgras's evocation of a warrior ancestress to fight a modern battle in "A house made of sunset." Next was Lilith Three Feather's account of how the Goddess Lilith drove her to overcome illness, disability and adversity in "Transformed." Lorene Wapotich describes her work with bringing women to the wilderness in "Her feet on the earth" while Gryphon Rosemead reveals the martial and transformative power of the Goddess in "Kali Waits: My journey to heal from sexual abuse.) Coming to grips with the role of the Warrior Goddess in "The Morrigan: beyond the war zone", Joan Robinson-Blumit questions whether the "warrior" image can be redeemed for women at all, while Diana Paxson examines the multi-faceted history and meaning of a famous female war leader and martyr in "Jeanne D'arc: Path of the Spiritual Warrior." Starhawk, arguably the world's most famous Witch and author of "The Spiral Dance" shares her thoughts taking risks, political action and the connection between magic and belief in an exclusive interview with SageWoman editor, Anne Newkirk Niven. And don't miss our columns, including (but not limited to): Susun Weed on the onion (lily) family of herbs; Lunaea Weatherstone on Lady Luck and the Wheel of Fortune; Ann Kreilkamp on creating neighborhood community; Stephanie Rose Bird on flower essence allies; lots of reviews, and the beginning of a rip-roaring argument in the Rattle on the relevance of SageWoman's blend of spirituality and self-help in the post-911 world. 96 illustrated pages, edited by Anne Newkirk Niven, released in spring 2007.